Normally I wouldn't have read this book just yet, but when Janice sent me the book she teased me with some names from the book and of course my curiosity got the better of me, and I'm so pleased it did. If you have been following the Beauchamp series, then you will know all about Leo (sigh) and Vernon. This time we are following Cecily who if you remember is their younger sister, and from the age of seventeen has helped to bring up Leo's children Dominic, Alex and Olivia from his first marriage. But now that Leo has married Rosalind and Vernon has recently married Thea. Cecily feels she has lost her place in the family and at thirty she knows, she will be invisible to the men of the ton. Its while Cecily is at Vernon's wedding that she meets Zach. I must point out, please don't think that Cecily isn't a strong woman, because she is, she just feels she hasn't a purpose in the family now that her nephews and niece are now grown. 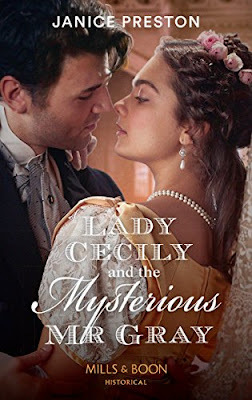 So Cecily comes up with a plan, to get married to a man, who appears on the outside to be a respectable gentleman, but underneath he is horrible. As you know if you have been following my reviews of the Beauchamp's, then you know how much I love Leo. Unfortunately this time Leo is now second to Zach, so what can I say about Zach, apart from he is utterly gorgeous. He is a man who was born into one world, but had to go into another when hi father died, but he is a man who is so kind and gentle, and not just Cecily. But when Zach is pushed he will defend himself, but not in a violent way. As I was reading the description about Zach, he reminded me of Aidan Turner...which I'm pleased to say Janice did confirm for me. Now you know why Leo has come second. As I said at the beginning, Janice teased me with some names, so I will share the names, first we have Athena, Myrtle, Sancho Panza and Titan. Two of these I would love to have. Also in the book, we get to see Olivia, her book is next. She is going to be a minx and I can see Leo being a very over protective father. He was also tried to be a over protective brother, and I can understand why, but he had to trust Cecily and I was so pleased he did. I just adored the ending of the book, and it made cry because it was so beautiful. As you can gather I adored this book and I will definitely give it 5/5 stars, if I could give more I would. This book is on pre-order at Amazon and is released on 3rd May. The next book is Lady Olivia And The Infamous Rake, this book is on pre-order at Amazon and is released on 23rd August, this is book 4 in the Beauchamp series.